-- DOPE 3D of the month Award. -- RAPH Jury pick Award. -- ITSARTMAG weekly selection Award. -- TREDDI Award Best of 2012 , 2013 and 2014. -- CHARACTERS FORUM Excellence Award Best of. -- BEST OF EVERMOTION Award. -- 3DARTIST online -Image of the week. 3Dartist Magazine Issue 65, Mar 2014. 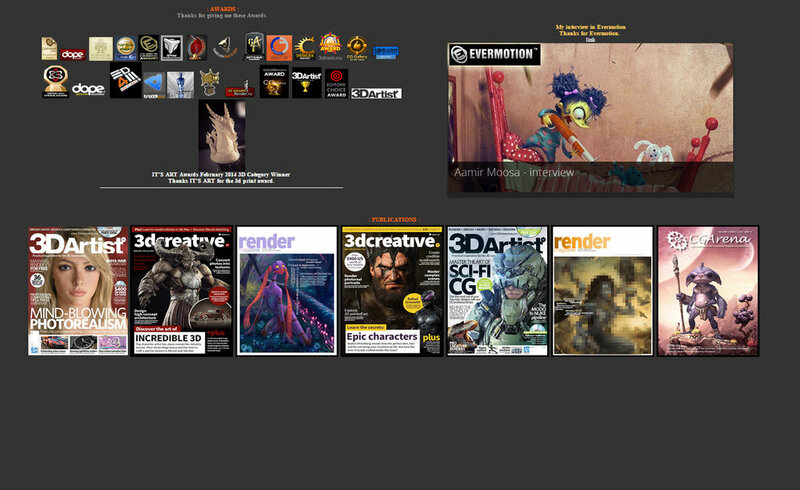 3DCreative Magazine Issue 102,Feb 2014. Renderu Magazine Issue ,Feb 2014. 3DCreative Magazine Issue 100,Dec 2013. 3Dartist Magazine Issue 62, Dec 2013. Renderu Magazine Issue ,Dec 2013. CGarena Magazine volume 8, issue 1, Feb-Mar2013.